Leopold's Crate: Putting your dog on a "belt" can be helpful when you need your hands free. Putting your dog on a "belt" can be helpful when you need your hands free. A couple weekends ago Chris, Leopold, Halo and I were at the SPCA Walk for the Animals running the Chesapeake Taste booth. We had a great time, and Leo and Halo had a blast meeting lots of new people and dogs! While Chris and I were setting up and taking down our booth, we needed our hands free but had no where to put the dogs; we did an old trick that I learned when Leopold was a puppy. What were we doing? 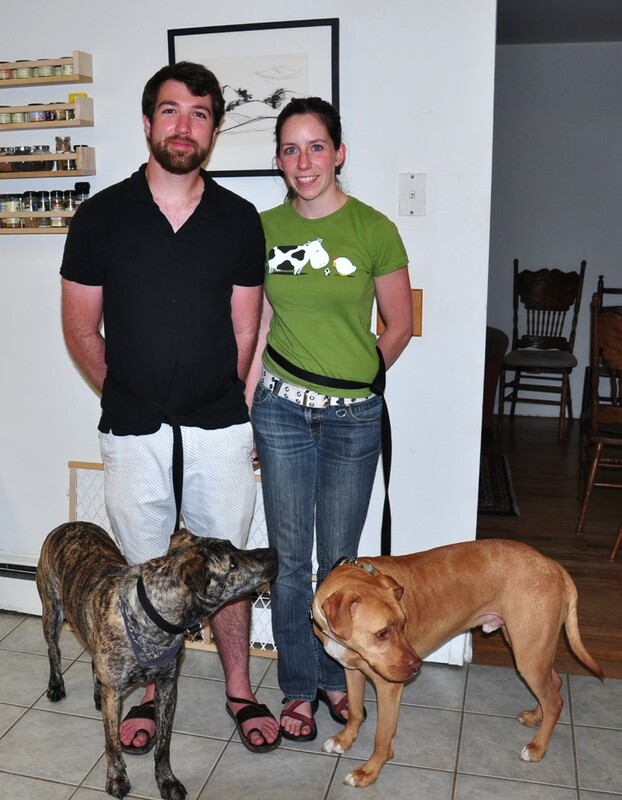 We were making what Chris and I have termed “dog belts”. We fed the leash through the leash handle, making a loop, and then slipped the loop around our waist like a belt. This way our dogs couldn’t run off, but we could have our hands free. Someone from a nearby booth said that it was clever trick and they would pass on the trick to a friend who had a dog. This made me think that “dog belts” might be a nice thing to do a quick post on! As I said above, “dog belts” are something I learned when Leopold was a puppy. I read about it somewhere and found that a “Leopold belt” was a great way to keep him close to me so that I could better keep an eye on him to keep him out of trouble or correct a bad behavior when it happened (you can’t correct a behavior that you’re not there to see!). Eventually Leopold learned what he should and should not chew on and play with. I continued to occasionally keep him on a “belt” though, because before he learned that he shouldn’t go to the bathroom in the house at all, he learned that he shouldn’t go to the bathroom in the house when I was around. He would sometimes slip around a corner and do his business out of sight because he knew that I scolded him every time he did it when I was there to see. Clever dog. So if he was in a room where he would be able to slip out of sight, even for a second, I put him on his leash and put the leash around my waist. This was a good way to make sure he couldn’t slip around a corner but still allowed me to have my hands free to do whatever it was I was doing. Making a “dog belt” has continued to be a useful trick for situations in the house (we made “Halo belts” quite often after Halo moved in with us) and out. Tips on brushing your dog's teeth. Nylabones: for dogs who love to chew. Keeping the peace: a lesson on dog body language. Cleaning Halo's ears for the first time.